Ever wonder how artisan bread bakers get such perfect round loaves every single time? 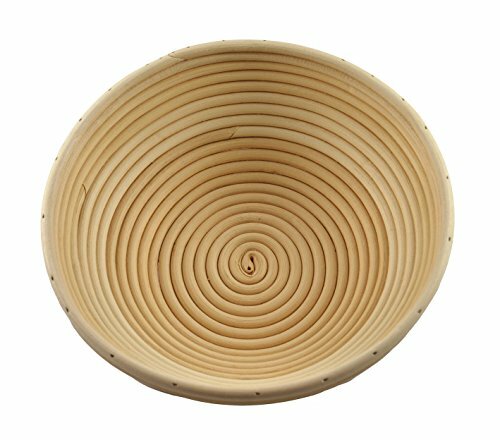 At nearly 10 inches wide at its diameter, this traditional bread rising basket, known as Brotform in German, ushers the taste of Europe into your home. Whether you are inspired by the French artisan bakers or the Italian bakers, let your home-baked artisan breads rise in a Broftorm and experience the taste of timeless kitchen traditions. These bread rising baskets, also known as bannetons, yield a better rise, a crunchy ribbed crust, and superior texture. They are very easy to use. Just flour either the bare basket or the linen liner generously, shake out the excess and place kneaded dough in the basket for the final rise. Transfer the loaf onto a baking sheet to bake. Also works with bread machines; you can let the machine knead and prepare the dough, then place the dough to majestically rise in the Banneton. The natural rattan cane coils shape and give the loaf character the old-fashioned way. A decorated country bread with a great texture and golden crunchy crust is what you get. To remove any remaining flour, simply tap the basket on the counter. The only other maintenance is an occasional hand washing in warm water. This sturdy basket is even attractive enough to double as a serving piece for outdoor meals and entertaining. Because rattan is a natural fiber, it holds the flour that you prep it with between its fibers and improves the proving performance over time. If you have sticky pieces of dough you can let them dry and scrape them off gently with a brush. If you are concerned about mold or bacterial growth, we recommend letting them sit in direct sunlight, and the UV rays of the sun usually act as the antibacterial agent. BUY NOW with PEACE OF HEART & MIND. Rest easy with our no-risk, money back guarantee. If there is anything not right with your new basket, return it for a full refund (terms apply). STURDY & DURABLE - Crafted with care, this basket will be a baker's companion for the long term. Whether using it in your own home kitchen or bakery shop, expect it to produce consistent golden results with beautiful floury rings. GENEROUS SIZE - Ideal for making artisan breads at home or at the shop. Bakes a hearty size loaf for friends and family in this 10-inch diameter round proofing basket. Use it for a better rise, crunchy ribbed crust and superior texture. NATURAL & ECO-FRIENDLY - Made with natural rattan cane, free of plastic or hazardous chemicals. Perfect for proofing (or proving) your dough for your homemade bread loaves. If you have the organic-oriented kitchen, then you will love baking your artisan loaf with this Banneton (or Brotform as known in German). HEALTHY LIVING - Bring the taste of Europe into your kitchen. Just dust the round basket with flour, put your kneaded dough in, and watch it rise. The natural cane coils shape and decorate the loaf the old-fashioned way. BEFORE USE - Doubles as a serving basket. Gently hand wash in warm water and thoroughly dry after cleaning. Flour well to avoid sticking. After turning bread out, allow the basket to dry and then wipe round with a soft dry brush. If you have any questions about this product by Adore Amore, contact us by completing and submitting the form below. If you are looking for a specif part number, please include it with your message.